Projetex: Translation Management System years ago Projetex was the first translation management system around. Now it is the most comprehensive translation management software for translation agencies, with over 250 distinct features developed since 1999 to . By using this translation management system, you can double productivity of your project managers. Let them work regular office hours without need for overtime. Make them more happy and motivated by establishing clear workflow and reliable collaboration platform. It tremendously simplifies task of corporate and freelance workflow management, data and files sharing within company and provides multiple benefits for each team member. System Administrators, General Management, Sales Representatives, Project Managers, Human Resources Managers, Corporate Experts, and Accountants will be able to quickly learn Projetex 3D and upgrade their work processes. Projetex will also suit smaller work environments where single team members may have two more of these roles combined. Faster database server: FastFire ® Connectivity technology enables Projetex database core to work 50% faster over LAN and 15(!) times faster over the Internet than previous versions. Multiple currencies support: Accounting is possible using multiple currencies, which are automatically converted into your company's Base Currency. Accounts of Clients and Accounts of Freelancers are clearly visible at any moment in time. Account management system: Project Accounts are based on Client Jobs Totals, Corporate Jobs Totals (calculated as Average Hourly Rate of Corporate Experts' Time Spent on Project), and Freelance Jobs Totals, and provide good indicator of particular project profitability. File storage automation: All rights to files and folders are assigned automatically. Translators and project managers work locally with their assignments and upload them to server as soon as they are ready. 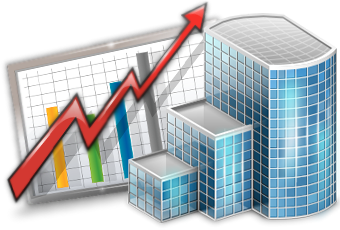 Included FastReport engine allows creating of Custom Reports to extract any accounting, financial and other information from Projetex database in the form of tables, charts, diagrams, etc. Customizable corporate workflow documents: Job assignments, purchase orders, invoices, quotes are saved in .rtf files using fully customizable templates. Improved file manager: Now with a few clicks all relevant folders (for example, all job assignment and purchase order folders of a given project) can be opened in the second field of Files tab. AnyCount 8: Projetex 3D now features built-in bestselling AnyCount 8 Enterprise edition text count engine. Numbers in AnyCount notes are now aligned into distinct columns. 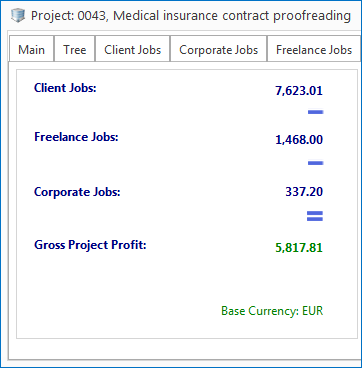 Comprehensive projects structure:Tree-like view of project showing corporate jobs and freelance jobs, which correspond to each client job. Clear distinction between corporate jobs (jobs done within translation agency) and freelance jobs (jobs done by individual external experts or vendors). Job quality assessment: Projetex provides ability to rate quality of each expert job and take in consideration average quality of jobs when selecting them. Search options: Easy-to-use search of freelancers by prices. Easy-to-use search of freelancers by completed jobs. Freelance expert teams: Every project has a Freelance Team, which allows to shortlist eligible translators before making final choices. Detailed filters with various time and status spans: Project records can be filtered by various conditions including Not Completed, Not Completed — Overdue, Not Completed — Due Today, Not Completed — Due in the next 5 days, and so on. Color highlights for current projects and jobs: deadline is in the future, deadline is today, deadline is in the past. Quick expert assignment: Single-click issuing and tracking of Job Assignments for Corporate Experts and Purchase Orders for Freelance Experts. 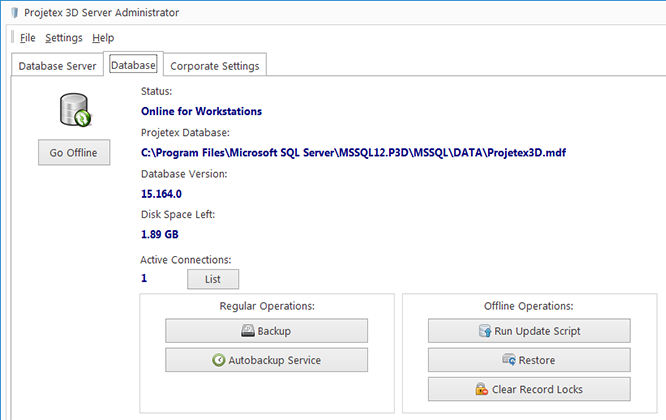 Custom fields in most sections of Projetex for even more database customization. Project file management options: Projetex automatically creates and maintains consistent and logical folder structure. Project files can be quickly accessed without the need to switch between Projetex and file explorer windows. Built-in FTP client: available directly on Files tab for quick access to Clients and Experts FTP folders. Automatic numbering of workflow documents: Automatic global invoice numbering, as well as additional client-specific invoice numbering. Automatic global numbering of purchase orders to freelancers, as well as additional freelancer-specific PO numbering. Automatic expert-specific numbering of Job Assignments to corporate translators and other experts. 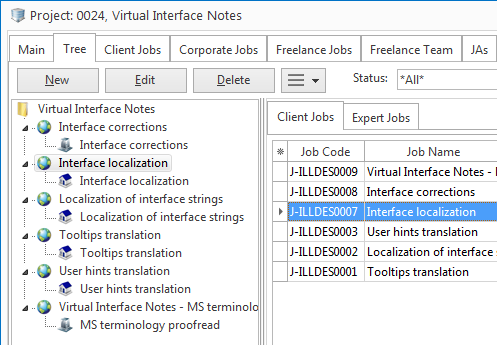 Client-specific numbering of quotes, jobs, and payments. Expert-specific numbering of quotes, jobs, and payments. Invoice management: Overview of all due and overdue invoices to clients, dates of expected payments displayed. Purchase order management: Overview of all due and overdue purchase orders issued to freelance experts. Flexible system of linking payments with invoices: Multiple invoices can be paid by single payment, single invoice can be paid by multiple payments. Ability to enter special phantom payments and phantom invoices to settle negligent amounts. Currency exchange rate calculation: Client Currency, which differs from Company's Base Currency can be set up for payments from clients in other currency. Expert Currency, which differs from Company's Base Currency can be set up in cases, when there is a need to pay expert in his or her particular currency. Account-based management of Projects and Client: Account Managers now are assigned Accounts instead of Clients. Client can be a single account (as before) or multiple accounts, with a number of Projects and Account Managers assigned to them. Mass action: Quick generation of multiple Invoices, Purchase Orders and Payments. 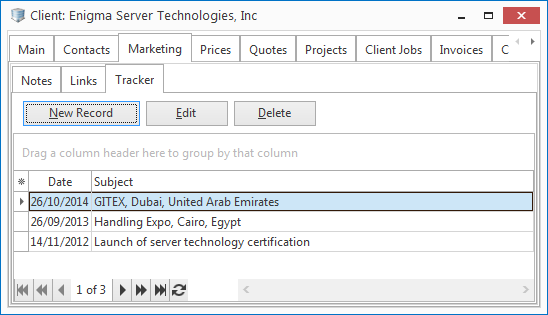 Invoicing policy settings can be configured in client’s profile, providing the ability to track if a client job is ready for invoicing. Phantom payment and invoice notes can now be added. Completed jobs management: an expert can keep the records of all jobs done. Time management: Easily see how much time is left for particular job. Done, Due today and Overdue job status: Clearly see which jobs are done, due today and overdue. Work files management: Quickly navigate in the folders of job assignments. Consistency in pricing is maintained through General Prices and Prices relationship. There are main General Prices, which serve as a reference point, and custom Prices for each client. Recording of both prices and quotes allows to be both selective and consistent in pricing. Marketing Notes, which can be used to maintain a kind of client dossier, to better understand their needs. Marketing Tracker: A user can keep track of negotiation path and prospecting history. Custom Fields: Ability to add custom fields to Client Profile. 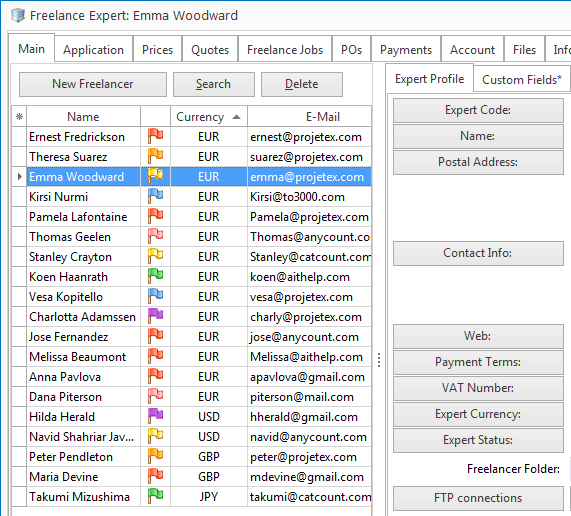 Freelance experts database: Ability to create and continuously enhance shared database of freelance experts. Custom fields: Unlimited number of custom fields for freelance experts database, with various types: Number, CheckBox, String, Text, Date, Time, and so on. Application Notes: Together with Application Tracker, Application Notes enable a user to track progress of particular applicant through translation agency's application process. General Prices for Freelancers: Accessible as reference source, serve as guidelines for acceptable prices for translation agency's projects. And many other benefits for System Administrator, General Management, Sales Representatives, Project Managers, Human Resources Managers, Corporate Experts, and Accountants! A-A Language Services (AALS) is one of the top language services companies of the southeastern United States, providing top-quality language services with a speedy turnaround at a reasonable price. AALS is a comprehensive solutions provider that specializes in handling complex technical requirements in areas ranging from foreign-language typesetting and desktop publishing in all major programs.